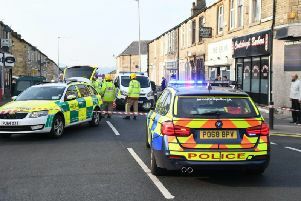 A main road into Burnley has reopened after a brief closure this morning, according to police. Officers closed the A682 Manchester Road from Burnley to Crashawbooth in Rossendale at 5-45pm on Tuesday following a two car collision and reports of cars being abandoned as snow and ice made driving difficult. A black Ford Focus and a blue Toyota Yaris collided near to the Waggoner's pub around 5pm, forcing police to close the road as traffic was tailed back in both directions. A police spokesman said: "We advised motorists at the time not to leave their cars and not to move. Thankfully, no serious injuries were reported from the collision. "The gritter was called out to help clear the road, which was closed at 5-45pm. It was reopened at 8-15pm the same night and closed briefly on Wednesday morning."